It’s hard to believe that it’s already that time of year again when frying pans get oiled up, batter is mixed and the height of a ceiling is measured in the International Unit of Flips. Yes, we are talking pancakes and Omlet will be running a competition to find the 2006 Pancake Person of the year with marks awarded for the highest toss, number of complete flips and the most convincing accidental pancake in the shape of a chicken! It’s on the 28th of February this year and to enter all you have to do is send in your pictures or video clips to johannes@omlet.co.uk ( a fully qualified pancake judge having trained with the celebrated French specialist Philipe Filop) The winner will take home an Omlet apron and there will be two runners up prizes of Good Life DVD’s. All entries accepted until Thursday the 2nd of March. Flipping good luck to everyone! A Big Thankyou! Jane Howarth from the Battery Hen Welfare Trust has written to say that the money raised from the Omlet Christmas Cards is going to be put towards improvements to the hospital wing at the rescue centre which will make sure poorly chickens are given the best possible treatment. Jane asked that we pass on her thanks for all your support, they have already rescued 500 chickens this year with many more rescues planned for the rest of the year. With spring just around the corner, the Omlet tour bus is undergoing final checks before setting out on the road again. After a sold out tour last year the Omlet team have added more dates in 2006 (complete list of venues to follow soon) and the opening event will be at the One Life show in London on the 3rd of March. It’s going to be a great show for anyone interested in getting the most out of life. We’ll also be unveiling Omlet’s Hen Parties as well as it being an opportunity to see an eglu and talk to the eggsperts so come along, we’d love to see you there. No longer a wriggly problem! My girls go absolutely mad for maggots to the point where they will mug me for them and leave little chicken footprints all over me in the rush to get to the bait box. I can’t stand the things though. They make my flesh creep and it’s always been a case of get someone else to feed them or throw the maggots out of the bait box towards the girls and run in the opposite direction in case any crawl towards me! 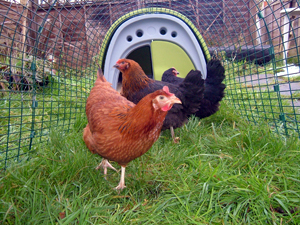 Well not anymore as I’ve discovered a non-wriggling way to keep the girls and me happy – dried mealworms! I found some in our local pet shop where they are sold for the wild birds. Apparently Robins go crazy for them too so I like to put a few on our bird table for my little friends whenever the hens will let me. The mealworms I buy come in a re-sealable pouch so no danger of accidental spillages to scare the living daylights out of me and the girls think they are the best thing since……maggots! They are very high in protein so make a really good, healthy treat for them and once the packet is opened, it should last for ages – given half a chance! The first image in the gallery of guinea pigs in an eglu deserves a special mention! Rabbits also ponder the meaning of life. – Hi there! Got my lovely ladies two weeks ago, still no sign of eggs but not really expecting any just yet….bit concerned that they sleep and poo in the nesting area and Florence always seems to have a mucky tail (actually, her tail feathers look oily but I’m assuming it’s poo, she hates me looking at her bum!!). Also Emily absolutely hates being picked up, have tried several times but she seems to get very stressed and I don’t want to frighten her. Should I keep trying? I lure her over for a quick stroke with treats which always seem to go down well!! Must say, they are beautiful and I do love that soft clucking noise they make when I get them up each day, also the way they squeeze through the door together!! Jazz’s chicken impressions are so much better now she has the real thing. Chickens, Penny, Peggy, Milly and Martha! 4 goldish in the pond…no fixed names. If you were stranded on a desert island what luxury item would you have? My pets! Do your chickens have a party trick? Chasing grapes down the garden like they are hockey pucks entertains me massively. … now they are positively posing for the lens! Mealworms (Tenebrio molitor) are the number one choice for treating your chickens. They are the larvae of the Flour Beetle, a native British insect which eats flour, meal, grain and other related crops. Their bodies are made up of over 48% crude protein and 40% fat making them an excellent, proven food for all insect eating garden birds. You can order them live (still wriggling) or dried (still tasty but without the wiggle). Strong urges to travel dominate your dreams this month. The Full Moon on the 13th is the optimum time to make your move so make sure your crop is full on the 12th – you have a long journey ahead. When you arrive the voices will sound familiar but the accents may be different. Your presence is sure to generate much curiosity and excitement and if you play your cards right you could become a star. This intense colour has enormous power attracting attention from far away. Just remember that with great power comes great responsiblity.